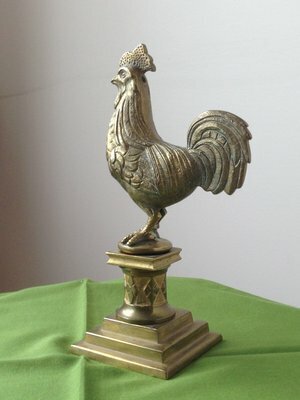 This is an image of a brass rooster created by George Mowat in the early 1870s in order to fulfill an apprenticeship program in Glasgow, Scotland. George brought the rooster with him when he settled in Whitby in the late 19th century. The statue continues to be a prized possession of the Mowat family and belongs to Malcolm Mowat, grandson of George. George Mowat emigrated to Toronto in 1879 and later settled at Whitby. Both he and his son, Roderick, found employment at Martin Manufacturing Company (the Buckle Factory) in Whitby. This image was uploaded with permission from Dave and Malcolm Mowat.